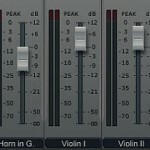 Tags: Classical music production techniques, Using reverb effects in mixing. Most orchestra music are produced live where actual musicians are playing together and miked all the way to an audio mixer and recording equipment. These live recordings are already pre-adjusted and mixed by an audio mixer in the orchestra before it will be recorded. This is the traditional way of producing orchestra music and it can be expensive since you will be hiring an orchestra to perform the music. One great alternative is to produce the orchestra music entirely using a music notation software such as Notion 3. Assuming you have great musical skills and you have a complete music sheet of the project, you can actually create a sound recording. Of course since everything is done using a software, you will be needing to assign a reverb and panning settings to the musical instruments in the mix. Refer to the panning chart, the center of the orchestra is panned at 0. This is the center of the stereo mix. 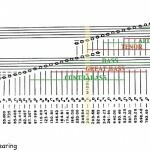 This corresponds to 0 in your audio mixer panning setting. 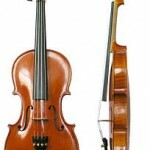 For example the instrument that is found in center is the viola. 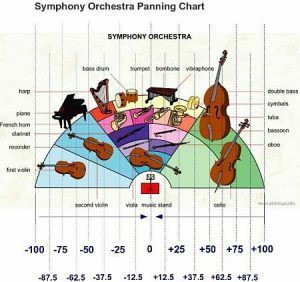 But viola instruments can span from -12.5 to +12.5 because there are so many violas in the actual orchestra. If your audio mixer setting is not using the scale of 0 to 100, but in terms of 0 to 1. Then +50 means 0.5 or 30 means 0.3. In terms of percentage, -75 means -75%, +12.5 means +12.5%. 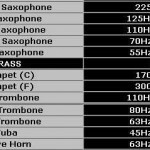 For the reverb settings, since they are all inside in the same concert hall, the same reverberation affects all instruments. 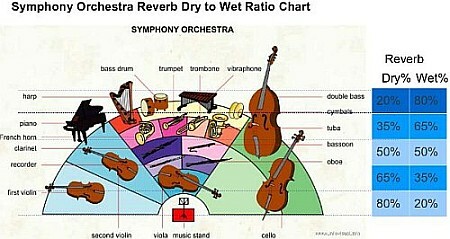 However, instruments on the front are sound “drier” than those in the back. For example, since the first violins are in the front of the mix; they sound much “drier” than the second violins which are placed at the back. The second violins have much more reverb content than the first violin. 1.) For all instruments use a single reverb preset like concert hall. Looking at the chart, the first violin can be assigned with 80% dry and 20% reverb while the second violins will have 65% dry and 35% reverb. Far in the back like trumpet and piano will have 35% dry and 65% reverb. As a summary, a wise combination of panning and reverb can make your mix sounds like they are in recorded live in a real symphony orchestra.